Courtesy of the artists The Bowlicks play the Sanctuary at 7:30 p.m. on Friday, May 18. The more creatively named bands featured this week got my wheels spinning down memory lane. Despite a preternatural and seething distrust of all things over and done with, I couldn't help thinking about some of the uniquely named groups I've encountered over the decades. I myself used to front a New Orleans-based punk/psych outfit called PonyKiller, named after any car that can beat a stock Mustang flat-out in a street race. During those years I encountered Child Bite, Dumpster Dummy, Evil Army, Red Shield, Mountain of Wizard and Cavalcade. I once watched a trio of large men in North Carolina play doom metal under the moniker Pig Mountain and a foul-mouthed hip-hop puppet named Doogie Fontaine. And to what end? To paraphrase Roy Batty in Blade Runner, all these moments will be eventually lost in time, like tears in rain. There's raw vinyl in Eureka for the starved polymer gourmand. Phatsy Kline's features Marjo Lak spinning black gold on her decks at 7 p.m. for the weekly Laidback Lounge and over at Siren's Song at 8 p.m., the 33 and a third Thursday brings old skool sounds curated by DJs Goldylocks and Fade. As always, both events are free as a bird. 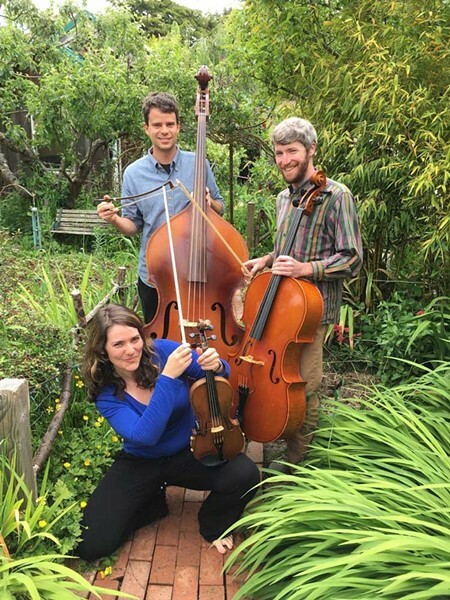 Jazz bassist Nate Zwerdling, classical cellist Jesse Alm and folk fiddler Rosalnd Parducci meet up Voltron-style at the Sanctuary at 7:30 p.m. to form The Bowlicks for fun covers spanning the jazz, blues and standards world with help from vocalist Hannah Rosencrans. ($5-$20 sliding scale). Meanwhile, at the Arkley Center, The Eureka Symphony Orchestra closes its 2017-2018 season at 8 p.m. with a repertoire including Cherubini's Requiem No. 1 in C Minor ($19-$49). The show is called Transitions from the Past and features a sale of prints by artist Katherin Burleson from her Creation series. Metal is on the menu tonight at the Siren's Song at 6:30 p.m. for those suffering from twee-fatigue or iron deficiencies (price TBA). Join Yreka's thrash masters Chains of Belmont — that has to be a Castlevania reference, right? — with Shasta Lake City's Bullet Lobotomy and local metal mavens Muppet Hunter and Unholy Orifice (moment of appreciation for two stupidly cool names) for a neck bending blood-feast. Collin Yeo has been a vampire hunter, space pirate, prince of the universe and Mario Brother. He has also rarely played video games. He lives in Arcata.